I'm a curious fella. Ask anyone. Thankfully, my curiosity is not limited to nosiness. 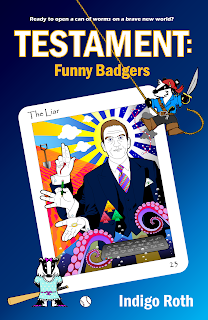 I like to think that when a question is vexing me, I have the skills to find the answer. It's last Sunday. I'm laying in bed, trying to remember something from my youth. I don't like to think at bedtime; that's what dreams are for. But this is tantalising, and skipping round the perimeter of my recall. Something I once read when I was maybe ten years old? Something about an obscure movie about a burning city. It's 1979. I'm at school, flipping through a magazine I've just bought. At sixty pence, it was pretty steep, but it's a science fiction publication, and therefore essential. It's mostly printed on coarse paper in black and white, but it has a glossy colour double-page in the middle, which I've never seen before. I'm reading - thrilling - over the photos from cool movies that I'll not legally be able to watch for a few years; ALIEN, SATURN 3 and METEOR. But besides this, there's a lot of text to wade through, interviews and articles. And right at this moment, I'm slack-jawed about an movie that is being made where they actually found a town that was prepared to be burned down! Back on Sunday night, the memory bubble bursts, and I start awake. Dammit, I almost had it. What was that movie called? It was a low-budget flick about a city that was on fire. In fact, the budget was so low, the producers advertised for a town who'd do the honours. And, unbelievably, they had several takers, and chose to film using one in Canada. But what was the name of the film? INFERNO? No, I'm thinking of THE TOWERING INFERNO. Hmmm. I try to recall who the stars were; that's often an easy way to find obscure films using one of the online movie databases. Trouble is, it was low-budget, so probably no-one of note was in it. My thoughts drift back to the name. 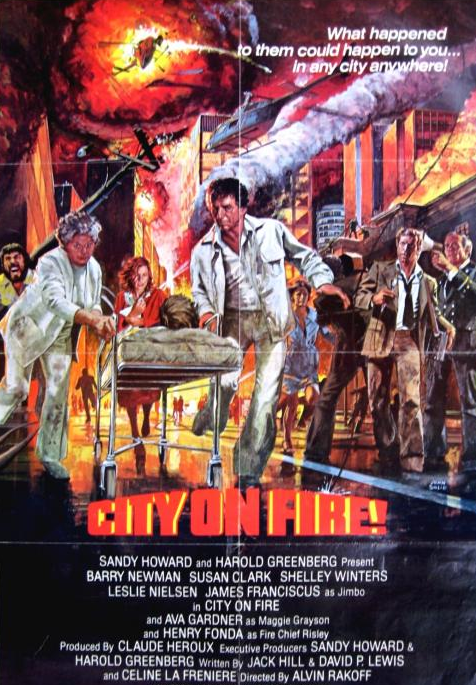 What's a cool title for a film about a city on fire? I sigh, and roll over, frustrated; it's too late for internal wordplay. I fumble for my phone, find the start button on the third attempt, and and squint uncomfortably at the brilliance of the screen. My hands are still dozy, but I finally fumble up Thesaurus.com to search for other words for FIRE. Hmmm. FLAMES? How about CONFLAGRATION? BURNING? Nope, no bells being rung there. I try a few more ways to find it using a search engine, questions and keyword searches. Nada. Straightening out the tormented duvet, and trying not to notice the clock, I focus on the magazine that I read about it in. Oh hell. Now, what was that called? STARLOG? No, that's a posh American one, and mine was English. But it was something like that. SUPERNOVA? No wait, STARBURST! Yes, STARBURST! Finally, a thread I can follow. I remember it had a white cover, and photos from STAR TREK: THE MOTION PICTURE and SATURN 3 on the cover. 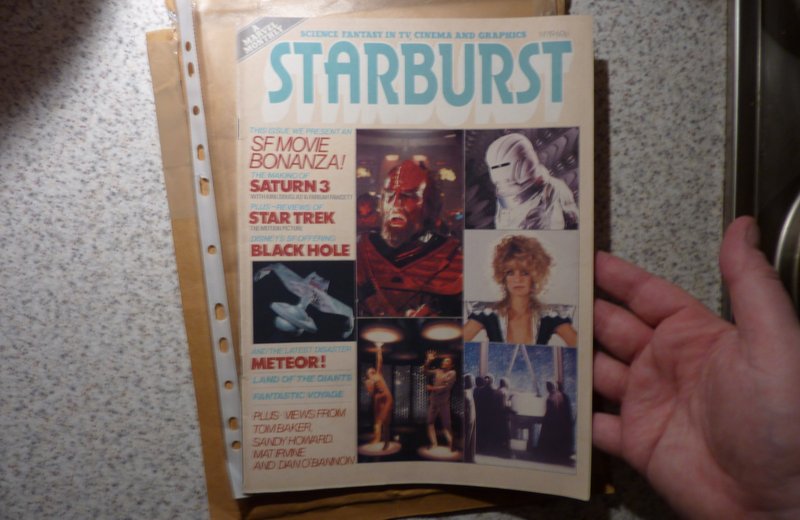 Search for OLD STARBURST COVERS seems a good place to start, and after a few variants on the wording I find the issue I owned! That's it! A creamy white, but with just the photos I remember! Good grief, volume 2, Issue 7. But 1979, just as I thought. The picture of the cover makes me smile as I start to drift back to 1979 again. Fatigue rushes alongside me, and tries to overtake. I shake my head clear, else I'll be asleep and the question will go unanswered. There's no summary of the issue or its online articles, but there's a link to someone who's selling the very issue I'm after. After a few taps and a PayPal password, I've bought the old magazine and resigned myself to answers in a few days time. And then, without ever having stepped from my bed to find those answers, the evening ends happily with the welcome embrace of sleep. It's Saturday. I'm drawn away from my breakfast by the sound of the mail arriving. I step excitedly through to the hallway as a padded envelope drops through my letterbox. Smiling, I know what it contains; not only nostalgia, but answers. Pleased with my ingenuity and tenacity, I return to the kitchen, tearing open the well-wrapped package with some difficulty. I grin my cheesiest grin. And, retrieving my tea and toast, I wander through to settle into the comfiest armchair in the warm lounge. Now this is a lovely moment. I flip through the magazine, searching for the article. Wow, I remember all this, but I don't immediately see anything about a movie with a city on fire. My brain is still trying to provide the title of the film even as I turn the pages, keen to deliver an answer before the magazine does; I'm competitive that way. Yep. CITY ON FIRE! Genius. They must have stayed up all night to think of that one; a rare movie title that defies deconstruction, but adds an exclamation mark to promise an extra helping of excitement. Of course, had I remembered that Henry Fonda had played a late-career bit-part in it, that would have ended the search in minutes. Or Ava Gardner, Leslie Neilsen or Shelley Winters! Feel somewhat deflated, I nevertheless enjoy the rest of the magazine with my breakfast; I'm rather partial to a slice of nostalgia with my tea. I'm a curious fella. With more than a dash of ingenuity. And a downright dogged tenacity when it suits me. But sometimes, in the pursuit of answers, my memory drops its loose change and hurries past the obvious. Haha! City on Fire! Who knew? It's great that you were able to find it though. I just ended a search for a tv show that took me a few years to find! And boy did I ever search!!! I just Googled City on Fire and found a whole lot of references to it, as well as dialogue on something called Wikiquote. Sounds like a real gem! I love the process you went through to rediscover it. i do hate it when i've forgotten something i want to remember. still, my favorite search engines are human. Hello! Well firstly I am new here, and love it and am moving in... in a non-creepy kind of way. I remember Saturn 3 (sucked), Meteor (not much better) and of course the now classic Alien, all movies I was too young to see and felt that the world was conspiring against me. I do also recall the junk-tastic Streets of Fire (Google it) to which i yes bought the soundtrack, but did not know CIty on FIre... man I gotta seek that one out! Fun blog, I will be back! ... or in Austrian accent, "I'll be baaack..."
Hi, Brahm! (jumping up and down and waving) Isn't Indigo just the coolest? Good to see you here. As far as I can remember Indigo any film with Shelley Winters in is best forgotten - and James Fransiscus? Even in earky teens I groaned any time I saw his mug on anything. Although a regular user of search engines I'm with Eloist and prefer the two legged variety if any are available. Search resukts are often much more hilarious which is probably just what you want to avoid at that time if night/morning. Never heard of this movie. Somehow I'm a bit glad about that, but you did start me off thinking 'Oooh - what was that movie about the guy who had to travel into parallel universes to try and clear himself of his partners murder way back when?' Yeah, thanks for that sunshine!!!! Have a good week. Don't work too hard. I have no memory of that movie. You'd think with a cast like that it wouldn't have been so obscure. About the title, don't feel so badly about overlooking the obvious. Anyone can think of the obvious. It takes a genius to be befuddled by such.